14: Who will claim this body? One is torn. Journalists, curators, backpackers, and Bidoun descend upon Egypt. Armed with a highly sophisticated form of reticence that in most respects resembles modesty — derived from hundreds of thousands of dollars’ worth of education. A conversation with Sanaa Seif and Hanin Tarek, two teenage girls who started a newspaper called Gornal in Tahrir Square during the revolution. Their co-founders include Youssef Bagato, Mariam Abu Ghazi, Mostafa El Kashef, Nada El-Marsafy, Lina Megahed, Hossam Shukrallah, Sami Soliman, Ziad Tarek, and Shady Said. Bidoun: How did it come together, how did it start? Sanaa Seif: We were all at Pierre’s apartment when Mubarak stepped down, celebrating. We were kind of talking about alternative media and how it was so important for the revolution to create alternative media. Someone said to us, “Why don’t you just start a newspaper?” We said okay, tonight we celebrate, tomorrow we have a meeting. And the next day we had a meeting and we started working on the newspaper, just like that. B: How long did it take to make the first issue? SS: I think it took about two weeks. It was the most hectic edition, it was short notice and we started working really fast. It was a bit messed up but we managed to get it out in the end. We started off thinking we were going to publish once a week but we’re all students so it became every two weeks, and now we’re discussing once a month. I think we’re going to be monthly. B: How many issues do you print? SS: The first issue was 10,000 copies and the second and third were 25,000. B: That’s more than us. How do you pay for it? SS: Funds from different people. Now we’re trying to create this network of funders so that no single person would pay a huge amount of money. B: How many editors are you? Who is the core team? SS: The core team now consists of only six members. But it will definitely expand after our exams. SS: I think it’s shrinking! Hanin Tarek: Sometimes we’re shrinking, sometimes we’re growing. B:So what is specific about Gornal? SS: When it started it was about challenging the law: in order to start a newspaper here you have to get certification from state security. So it was kind of a challenge; freedom of expression was our main goal. We’re open to anyone who wants to publish anything… it’s basically a tool for us to express ourselves and for other people to send in articles and stuff and we publish them. HT: We have no personal agenda. SS: We believe in awareness. Awareness comes through freedom of expression and not the other way around. So Gornal is basically about giving people a tool to express themselves. We try to choose main topics for each issue and sometimes we ask professionals to write about things we can’t write. For instance, we wanted someone who was a professional in military law and the curfew laws. Because there’s a lot of confusion on this issue — some people say they have the right to shoot you if they need to, other people say, no they don’t have the right to shoot you — they have to stop you or arrest you. So we thought we should make that clear. HT: Or we asked another lawyer to write about the difference between military law and the emergency law. It’s a bit confusing. B: Have you printed anything you don’t agree with? SS: We want to print things we don’t agree with. For example, one of the members of the Muslim Brotherhood is writing something. We want some articles from people who support the military as well, even if we personally don’t believe in the military’s performance in ruling the country. But many of these people don’t want to write. B: Why don’t they want to write? SS: I think it’s because the whole newspaper looks like it’s very revolutionary and stuff and so they just don’t want to join in with something like that. B: It seems like people against the revolution must have a hard time knowing how to express themselves. I mean, previously if you were “pro-Mubarak,” what did you do? Your job was to stay home. SS: Yeah, they won’t write. I was really disappointed. B: Maybe they don’t have time, they’re too busy emigrating. [Laughter] Do you feel like besides freedom of expression you have particular ideologies? Let’s say you receive a hundred articles and you have room for ten, how do you start to decide what to print? Have you rejected anything? SS: No, we don’t reject. But that’s why we’re doing the website, because sometimes people send us things that are too big for us to publish in the newspaper. Anything we can’t publish, we can put on the website. Sometimes we choose what’s the best written, or what’s most recent… And we definitely have an ideology ourselves, but we express it under our own names. B: I find it really interesting that you’re not publishing a newspaper from a certain point of view, or toward a specific objective. It’s about a mode of expression, an open forum. In a sense, once you guys are successful, Gornal won’t be necessary. HT: It comes back to the concept of establishing the same freedom we had in the square… We’ve worked on other things, too, like this event on a Friday when people made music in the streets. Before, we never had places to meet, so the idea was to change that. The police used to come out into the streets to stop it. SS: It didn’t work everywhere, but in some places people took the idea of organizing for themselves and are doing it over and over again. B: So how does that link together with Gornal for you? You want to see changes in public life, you want to take advantage of the situation — while no one is sure what is illegal or legal — to establish what will become normal? SS: Yes, that was the concept. 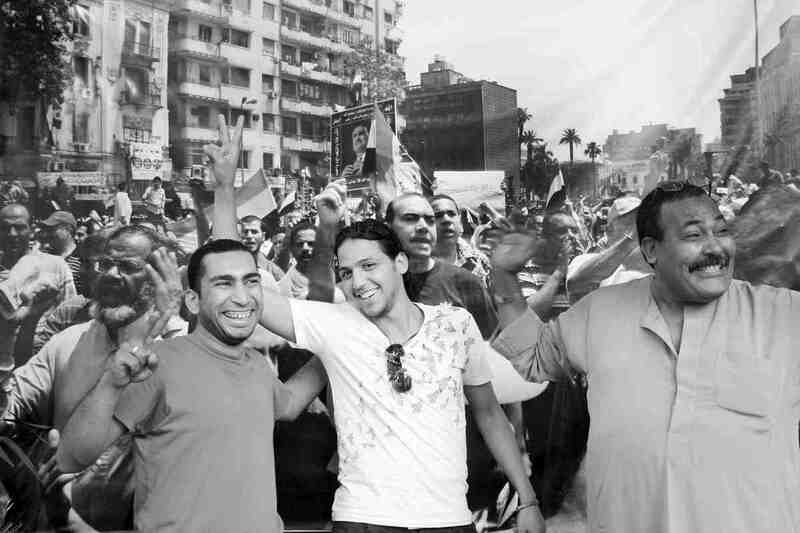 Right after Mubarak left, that was the time to establish freedom. This is the time to push the borders, we don’t have to wait for the law to change. It’s the time to start any initiative. SS: We were talking about how the internet was a major reason for this revolution and it’s true, the internet is a tool where you have actual freedom. At one point, it was the only space in Egypt where you could actually express yourself. I thought, after the revolution you have to value these things — if we don’t create new spaces now, it’s never going to happen. So that was where the idea came from for a newspaper. B: Do you think all this talk about Twitter revolution and Facebook revolution is exaggerated? SS: It’s very exaggerated, definitely. They think all we do is tweet. But it’s true that, like five years ago, people would complain about torture and stuff like that and nobody believed them. If you discussed police brutality with people in the streets, there was no awareness about it at all, but when the videos of torture came out on the internet… Things started to change. Maybe it could have happened through another tool, but this is how the change began. HT: There are still so many people who do not know how to use the internet, uneducated people. And a lot of people who are just not that into the internet and technology. So I believe that print is still the way that we can reach them. B: It’s also a bigger risk to print than to post, right? Is this part of why you do it? SS: According to the constitutional declaration, they can’t stop us from publishing without a court order, unless there’s an emergency case in which the newspaper threatens national security. But that isn’t well-defined! I don’t know who decides when a newspaper is threatening national security. HT: That law came out on April 14. SS: That’s another thing. We saw that the magazines and the newspapers that were attacking the revolution all changed sides after Mubarak stepped down. So we knew that the revolution had to create alternative media, not just newspapers but radio stations… everything. B: Who’s your audience, how do you distribute the paper? Do you bother with the villages or do you just try to get it out in the center of the city, to students? SS: We distribute in a lot of bookstores, like Shorouk and some cultural spots like Art el Lewa, El Sawy, Townhouse… We still haven’t reached Haram and 6th of October much. We sent copies to Mansoura and Menya. We also distribute copies at demonstrations. HT: I’m still discussing whether I can distribute the paper at my college. That’s still undecided. SS: And they can hopefully become contributors because there has been too much of a spotlight on Tahrir. B: Does anyone have any reactions, like: why are you doing this? HT: Our colleagues Hossam and Hany were distributing in Mustafa Mahmoud Square. A woman started crying and told them they were ruining the country. HT: During the revolution, they didn’t have food. Prices went up, so that was hard. SS: I kind of realized that two weeks after the protests. A lot of them are very angry, they say, “You’re ruining our lives.” Others are just too hopeless to even think about change, they just want to live this day. So they didn’t believe in the revolution because they didn’t believe that their life could ever change. B: And that’s scary, because it might get worse. SS: Right now, there’s something wrong, definitely. You have this insecurity and this paranoia, and tourism is a very big part of our economy and it is damaged. It’s causing too much fear. B: So what’s in the next issue? SS: We want to start interviewing all the presidential candidates. In this issue we will have Hamdeen Sabahi and Buthaina Kamel. And probably ElBaradei and Bastawisi and then later, Abou El Fotouh. There are twelve questions for each one. And then one that depends on the person. So Buthaina, we’ll ask her about being a woman. With Amr Moussa, we’ll ask about how he’s part of the old regime. B: Does the army take you seriously? SS: The army was scary. I called a lot until a secretary called me back. SS: I told him we are working on an independent newspaper and we want to do an interview with Ismail Etman, a member of the military council. And he asked me, “What is the interview about, and with whom?” And I said, “You can just say we are the youth of the revolution, you know, the Facebook people.” He asked me what the interview would be about and I told him we have torture testimonies and we want to print them and we want his response. SS: The secretary finally called back, and said he would need to check out our newspaper first. B: Did you send over copies? HT: I said, “You need a copy?” And he said, “No, we already know you.” They even had copies of it already. B: Are you going to tell them how old you are? SS: They probably know already. SS: We got to know each other at Pierre’s house. B: Sanaa, I know your parents are political, but Hanin — how do your parents feel about what you’re doing? HT: The same. My mother was okay but my father less so. My mom and my brother were in Tahrir with me all the time — he was actually there before me. My mom couldn’t sleep there, so she went home and came back in the mornings. SS: Although after Khaled Said was killed, I started to go to demonstrations. But I wasn’t very involved. SS: We’re doing the exactly the same thing. B: Can we ask you a really stupid question? Did you have a plan of what you wanted to do when you grew up? Before the revolution? And has it changed? HT: Well, my plan got ruined when I started college. I wanted to major in fashion design, but now I am majoring in journalism because there is no fashion design major. But I don’t think it has changed. I started thinking more politically about everything. My goals became more about the people; people around me at least. B: Are you still going to be a fashion designer? HT: Yes! For the people.